GardenWalk Cleveland Heights is a new organization formed to showcase the beauty of neighborhoods in Cleveland Heights, and to build community within Cleveland Heights and in the Greater Cleveland area. The first GardenWalk Cleveland Heights is planned for the weekend of July 20 and 21, from noon to 5 p.m. The spirit of GardenWalk is inclusive. Tours are free, and anyone who wants show a garden may participate. There are no judges or prizes. The 41st annual Heights Heritage Home & Garden Tour, sponsored by Heights Community Congress (HCC), is set for Sunday, Sept. 16, from noon to 6 p.m. It will celebrate the 50th anniversary of the landmark Fair Housing Act of 1968. This milestone is reflected in this year’s theme “Our Fair City,” with a variety of homes and gardens on display throughout Cleveland Heights. One featured property will be Harcourt Manor (the home you catch a glimpse of while driving up Cedar Hill), which has undergone extensive and elegant renovations to honor the early 1900s' era of this historic structure. The tour will feature other architecturally lovely and unique Cleveland Heights homes of all sizes, as well as gardens—from a “Food not Lawns” concept garden to the formal Alcazar courtyard. The Alcazar will also be this year’s Sunday tour refreshment stop, from 2 to 4 p.m.
Local author and illustrator Terri Libenson will read from and discuss her new book, Positively Izzy, at the Coventry Village branch of Heights Libraries on Wednesday, May 9, at 7 p.m. The event is part of Heights Libraries’ Cedar-Coventry Author Series, in partnership with Mac’s Backs - Books on Coventry. Q: How would you describe your new book, Positively Izzy? A: It’s a spin-off of Invisible Emmie. Both books are set in the same school and town, but this one stars two new characters: Brianna, Emmie’s best friend, and Izzy, a new character I’ve introduced. These girls have different personalities, kind of like Emmie and Katie. Bri is smart and bookish, while Izzy is a dreamer who loves playacting. Like Invisible Emmie, Positively Izzy also takes place over the course of a day, but this time it focuses on the school talent show. 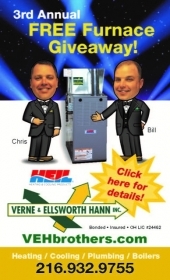 Cleveland Heights resident Jon Holmes received a free furnace from Verne & Ellsworth Hann Inc. as part of the company’s Helping Hann Free Furnace contest. An Army veteran, Holmes was nominated by his sister and brother-in-law, Jean and Don Lash of South Euclid. Holmes lives in the Forest Hill neighborhood, in a house that’s been in the family since 1942. The old furnace was installed in 1951 and had to be oiled every day—a difficult task for Holmes, who suffers from a nerve disability. It’s the Roaring ‘20s—World War 1 is over, women have the vote, jazz is king, and the Harlem Renaissance is in full swing. . . . Heights Community Congress (HCC) invites everyone to come along and enjoy a taste of the Jazz Age as it presents "Heights, Homes . . . and All That Jazz!” on Sept. 17 and 18. The 2016 Heritage Home & Garden Tour and preview party pay homage to the 1920s and the century that followed, and continue HCC’s fall tradition of sponsoring a look inside many of Cleveland Heights’s most spectacular homes and gardens. This year’s tour showcases seven homes, three of which also feature gardens, and one stand-alone garden. 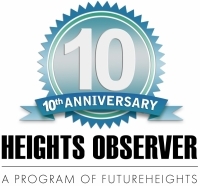 Celebrating Heights Libraries’ centennial, and honoring the Heights Observer, HCC kicks off this year’s tour with a preview party on Saturday, Sept. 17, 6:30–11 p.m., at Ensemble Theatre, 2843 Washington Blvd. (in the Coventry School building). Heights residents are hearing a lot about damaging stormwater and solutions to its runoff problems, including rain barrels, rain gardens, and reducing impervious surfaces, which include rooftops, driveways and even decks. Rain obviously can’t pass through concrete, cement, or your roof. Driveways, rooftops, patios and other surfaces, if installed correctly, slope away from your home, and guide water into grates on the roadway. Our current system for handling sewage and stormwater was built decades ago. It was not designed for the region’s current population, nor the amount of impervious surfaces. The year is 1920. World War I has ended, and the Roaring ’20s are ushering in a new Jazz Age. The Cleveland Heights Library has already been around for four years and, in the following year, Cleveland Heights will achieve the status of “city.” Come along with the Heights Community Congress (HCC), and be transported back to this gilded age on HCC’s 39th Annual Heritage Home and Garden Tour: Heights, Homes . . . and All That Jazz! This year’s preview party and tour pay homage to the spectacular homes and glittering fashions of the Jazz Age. The weekend kicks off with a Jazz Age-themed preview party the evening of Saturday, Sept. 17. Gathering at the home of the Ensemble Theatre (in the former Coventry School building on Washington Boulevard), patrons will board Lolly the Trolley for an early peek at select homes from the tour. When remodeling a home, appearance is often the primary goal. Homeowners should be mindful, however, that function and safety are more important. Remodeling can offer an opportunity to get things done right, and save money in the long run. When most Heights homes were built, placement of a laundry room was an afterthought, or was done without any regard to venting. One common modern trend is to locate a laundry room centrally in the home. Although this may seem convenient and sensible, it may be dangerous. One home inspected this winter had a centrally located basement laundry room. The dryer vent wasn’t taken into consideration when the home was built, and the vent had become detached in a finished ceiling—happily, the problem was discovered before it created a larger hazard. The Fifth Annual GardenWalk Cleveland will take place July 11 and 12, from 11 a.m. to 5 p.m.
For even the most casual of gardeners, purchasing new plants is among the many rites of spring. In Greater Cleveland, one of the most anticipated spring plant sales is the annual Master Gardener (MG) Plants in the Park sale, which will take place this year on June 6, 9 a.m. to 2 p.m., at 6363 Selig Drive, Kiwanis Pavilion, in Independence. The event offers free admission, and plenty of parking. Lois Rose, a Cleveland Heights resident and master gardener volunteer, is one of the organizers of this year’s sale, which benefits the programs of the Master Gardeners of Cuyahoga County. The warm, invigorating days of spring might seem a lifetime away, but eager Heights community gardeners are already sowing something for the 2015 season: new, innovative ideas. At the Heights Community Garden Network (HCGN) annual meeting—held Feb. 17 at the Lee Road Library—a dozen horticulturists representing community gardens from across the Heights laid out their individual goals, plus their hopes for larger events and new strategies to expand gardening opportunities this year. Samantha Provencio, coordinator for HCGN, commenced the meeting with a fast rundown of the organization, then opened the rest of the meeting for a free-flowing dialogue. The Nature Center at Shaker Lakes is offering an informational program on Tuesday, March 24, to help gardeners choose what—and where—to plant this spring. The "Dig In! What Grows Where?" forum will be held at the nature center, 7–8:30 p.m. The evening begins with a presentation by Nature Center Plant Sale Committee members of selections found in the annual plant sale catalog, available at the nature center—and for order online in mid-March—on Plant Sale Day, Saturday, May 9, 9 a.m. to 1 p.m. Following the presentation, a panel of experts will provide advice on which plants to grow where in a Northeast Ohio garden, including what plants grow well in sun and shade, how to incorporate native plants, and how to attract pollinators. Jamie Swisher of Cleveland Heights will be part of the Cuyahoga Community College (Tri-C) team competing at PLANET Student Career Days, a national collegiate landscaping competition that will take place at North Carolina State University, March 12–15. More than 850 college students from 65 of the nation’s top horticulture and landscape programs—including Tri-C—are expected to attend the three-day competition to test their skills in 28 events. Students will compete in 3-D landscape design, irrigation techniques, hardscape installation, plant identification, small engine repair and other events that require the expertise needed to work in the industry. Swisher is one of 16 students competing for the college at this year’s “Olympics of Landscaping.” Tri-C produced the individual student champion in 2014 while placing fifth as a team—tops among two-year schools. Starting in September, an eight-week Home Repair Resource Center (HRRC) class will teach the principles of landscape architecture and permaculture to help attendees improve the green functioning and aesthetics of their homes and yards. Taught by a permaculturist and a garden designer, the course will meet once a week on Thursday evenings, Sept. 18 through Nov. 6, 7:30–8:45 p.m.
Instructors will cover how to: keep water on-site (reducing water bills); improve soil without chemicals; attract pollinators and other beneficial insects; incorporate permanent edible plants and native plants into the landscape; and more. Participants will be encouraged to explore their own sites and apply what they learn to create a plan they can implement, to add beauty and value to their properties. Whether you'll be tackling a do-it-yourself project because you're excited about doing the work yourself, or because it's your only option, your focus will all too often be on design, material choices, and other "fun" aspects of the project. Project planning, however, should also include avoiding injury, minimizing exposure to toxic materials, and consideration of other potential dangers. Home Repair Resource Center (HRRC) invites homeowners to learn from contractor Mark Westbrooks what precautions they should take in planning repair projects. Westbrooks will present Working Safely: How Homeowners Should Protect Themselves when Doing Repairs on Tuesday, Aug. 19, 7 p.m., at HRRC’s Teaching Center, 2520 Noble Road in Cleveland Heights. Some people are afraid of electricity. Past participants in Home Repair Resource Center's (HRRC) Home How-To women’s repair course, however, have found that by understanding the “mystery” of electricity, and learning how to remain safe when doing electrical work, they can be confident trying basic repairs. Women are invited to enroll in the upcoming Electrical Repairs course module, consisting of eight workshops held on Wednesday evenings, 7–9 p.m., July 30 through Sept. 17. Participants will learn to replace switches and outlets, run wires through walls, install 3-way switches and GFCI outlets, put up ceiling fans, and more. The classes offer ample opportunity to practice using the tools and techniques required for many common electrical projects. No previous experience is required. If you need to repair a roof with slate, tile, copper flashings, or other “historic” materials, you probably know that special care will be required. What should you discuss with a contractor to ensure the work will be done properly? Home Repair Resource Center (HRRC) invites homeowners from all communities to attend a free presentation on Tuesday, June 24, at 7 p.m. on Repairing Historic Roofs: Slate, Tile, Copper Flashings and Other Special Materials. Part of HRRC’s HouseMender University series, the presentation will feature representatives from Uston Roof Restoration, who will explain what homeowners should look for contracting repairs for these types of roofs. Vivian Vail's gorgeous garden is at the corner of Somerton and Radnor roads in Cleveland Heights. It's a rambling home to luscious peonies, poppies, gladiolas, zinnias, sunflowers, sage, dahlias and many varieties of sedum. Her garden features huge rocks, sculptures and interesting objects, such as a carved wooden Don Quixote head. Perhaps you've seen her out working in her full-length signature sundresses. Watching her jump on a shovel (with dress billowing) to get down deep into the dirt is a dramatic treat. If you’re considering making changes to your home—redesigning your front entryway, remodeling your kitchen, perhaps enclosing your open back porch to gain an extra bedroom—it would probably be helpful to talk with an expert. On Monday, May 19, Home Repair Resource Center (HRRC) is sponsoring Ask an Architect consultations, for homeowners who would like free advice before embarking on a home renovation project. The architects will meet with homeowners in individual, 25-minute consultations, and suggest ways to maximize a home’s potential, and identify possible pitfalls. It can be difficult to choose replacement windows. Television ads tout various advantages—deep discounts and lifetime warrantees—but how does one sort through the hype to make an informed choice that will provide the most value for one’s investment? Home Repair Resource Center (HRRC) invites homeowners to its Choosing Replacement Windows presentation on April 22, at 7 p.m.
Britt Raburn of Lyndhurst Lumber will share advice on how to evaluate window products, and consider features such as overall quality, energy efficiency, warranty protection and ease of installation. After this very long, cold winter, yards and gardens here in the Heights will undoubtedly need some spring sprucing-up. Those in need of lawn and garden supplies—or just in search of something green—can support Home Repair Resource Center (HRRC) of Cleveland Heights by shopping at Bremec on the Heights between Monday, April 21 and Sunday, May 4. When shoppers present an HRRC voucher at the register, Bremec on the Heights Garden Center, 13410 Cedar Road, will donate a portion of those purchases to HRRC. Even those shoppers who may not yet be ready to take home plants and supplies can benefit HRRC by purchasing gift cards using a voucher during the two-week fundraising period. They can then use the gift cards at a later date. With periods of extreme cold come questions about the impact such temperatures may have on plant materials in the landscape. It is a good time to review potential damage to trees and shrubs, keeping in mind that much of the damage that may occur will not become apparent until new growth begins in the spring. By then, many of us will have forgotten the frigid temperatures that have now twice invaded the Heights, especially if it’s a mild spring, and gardeners may not relate plant damage to the extreme events of this winter. Weather conditions this past fall played a part in how plants prepared for winter. Trees and shrubs in our area received inadequate moisture in the weeks leading up to the first hard frost. Rainfall last August and September was below normal, leaving plants much more likely to suffer cold injury. Native plant materials in their natural habitats will better tolerate these harsh conditions, but native species planted in the urban and suburban landscapes of Cleveland Heights and University Heights, where soils and environmental factors are vastly different from their normal habitats, can experience cold injury due to stresses on the plants imposed by these exotic habitats. Most woody ornamental species used in our Heights landscapes are non-native, and even a species rated hardy to our region may not survive when exposed to extreme temperatures. Keep this in mind when assessing plant problems in the spring. Late September—the end of summer and beginning of fall—is when gardens have reached peak growth and late blooms glow against background foliage. It’s a good time to savor the end of the season with an afternoon tour sampling the “Dazzling Diversity” of some of the homes and gardens in Cleveland Heights. Dazzling Diversity is the theme of the 36th Annual Heights Heritage Home & Garden Tour, sponsored by Heights Community Congress (HCC). It is sure to dazzle with spectacular interiors, unusual exteriors, and colorful gardens reflecting the unique variety in the Heights. The self-guided tour of six homes and four gardens is scheduled for Sunday, Sept. 22, from noon to 6 p.m., and includes a refreshment stop at the landmark Church of the Savior on Lee Road. Often, homeowners presume that making houses more sustainable will require major lifestyle changes or expensive materials and technologies. That is not necessarily true. On Monday, June 17, 7–8:30 p.m., Home Repair Resource Center (HRRC), the Cleveland Heights nonprofit, will host an informal conversation on practical ways to reduce energy usage around the home. The event will take place at the BottleHouse, 2050 Lee Road in Cleveland Heights. The conversation, led by sustainability advocate Fred Cortright, will emphasize changes that are realistic, affordable and meaningful. Many home repairs could be tackled on a do-it-yourself basis, if the homeowner just knew what to do. That’s where Home Repair Resource Center (HRRC) comes in. HRRC’s repair workshops teach the “how-to” of basic home repairs, with a special focus on maintaining older homes. The workshops are taught by experienced professionals and include opportunities for hands-on practice with the tools, materials, and techniques needed for the project. Designed for women who want to learn how to make home repairs themselves, HRRC’s Home How-To for Women course in Carpentry Repairs will cover how to install ceramic tile, repair windows, build handrails, repair plaster and drywall, and complete other carpentry projects. The Carpentry Repairs module will include eight two-hour classes, held on Wednesday evenings from June 5 through July 31 at HRRC’s Teaching Center in Cleveland Heights. Applications are now being accepted, and early registration is suggested. Only 18 spots are available, to encourage small-group learning. Tuition is $120 for Cleveland Heights residents and $150 for nonresidents; low-income participants are eligible for reduced rates. If you’re concerned about mold and air quality in your home, don’t respond to scare tactics. Yes, mold can be a problem, but in many cases there are simple things homeowners can do themselves to discourage mold growth. Learn “What Mold Contractors Don’t Want You to Know” at 7 p.m. on Tuesday, April 16, at the Home Repair Resource Center (HRRC), 2520 Noble Road in Cleveland Heights. Gil Gotlieb of Airguard Restoration will discuss how to determine when mold and other contaminants pose a risk, what homeowners can do themselves to remedy the situation, and what issues should be discussed with a contractor. May flowers . . . and plants and herbs and vegetables . . . will color the Nature Center at Shaker Lakes parking lot during its 31st annual plant sale on Saturday, May 11, from 9 a.m. to 1 p.m. The sale features a wide variety of hard-to-find native plants, perennials and annuals selected by a local team of experienced horticulturalists. Annuals can be purchased in flats, individually, or in convenient preplanted hanging baskets. There will also be a wide selection of vegetable plants ready for a kitchen garden, and plant assortments one can combine to create a beautiful container arrangement. 'Tis the season for fresh and abundant locally grown food! More and more Heights residents are assuring themselves an abundant supply of healthy produce from local farms by purchasing a share from one of our local CSA (Community Supported Agriculture) groups. Adding a rain barrel to your gutter system can help control surface water—and reduce your sewer bill. Home Repair Resource Center's (HRRC) upcoming workshop, Building a Rain Barrel, will provide hands-on instruction. Participants can opt to build a rain barrel during the class, or choose to observe the process only. The class will take place on Monday, April 8, 7–9 p.m., at HRRC’s Teaching Center, 2520 Noble Road in Cleveland Heights. Reservations are required, and this class fills quickly; to reserve a spot, call 216-381-6100, x16 or e-mail rstager@hrrc.org. As temperatures rise and the snow disappears, Bremec on the Heights is getting ready to reopen its doors to gardeners in the Heights. According to Jessica Mitchell, marketing director, some "spring favorites" with Bremec’s customers are pansies, fruit trees, and annual and perennial plants. Bremec also offers organic lawn care items, such as fertilizer, soil, pest and disease control products, as well as garden décor items, such as fountains, statuary and pottery. The Electrical Repairs module in Home Repair Resource Center’s (HRRC) women’s repair series will begin on Sept. 5, with weekly sessions on Wednesday evenings through Oct. 24. Applications are now being accepted. Eight two-hour classes will be offered, including Intro to Electricity; Replacing Switches & Outlets; Running a New Circuit; Practical Troubleshooting; Lighting Options; Low-Voltage Systems (Landscape Lighting/Doorbells/Phone Lines); Ceiling Fans; and Exhaust Fans. What can you do for your lawn after this summer? This year’s weather has been particularly hard on yards and gardens. Beyond the drought and heat, lawns have suffered from additional stresses that may cause a slow recovery this fall. By mid-August, some area lawns were beginning to green and show signs of recovery. Early signs of recovery provide a good time to observe the extent of damage and how much work is needed to get the lawn back into shape. Areas that were brown but have begun to green again are recovering from summer dormancy. Sections that remain brown may have been damaged by drought, insects, disease or other issues. Regardless of the reason, it is time to take advantage of the cooler, moist weather and allow newly seeded areas to establish prior to fall leaf drop. On Sept. 23, some of the unique homes and gardens in Cleveland Heights will be open to the public for Heights Community Congress’s (HCC) 35th annual Heights Heritage Home & Garden Tour. In past years, tour participants have come from as far as Maine and Arizona. Nearly 1,500 tickets are sold every year. 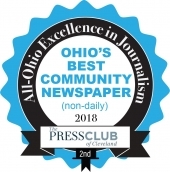 Tourists from outside the city “can't help but get a sense of what a great community Cleveland Heights is while taking the tour,” said Greer. Never mind the April snow—if the early spring weather has you working on your outside to-do list, the Home Repair Resource Center (HRRC) could benefit from your purchase of lawn and garden supplies. For the fourth year in a row, Bremec on the Heights Garden Center will donate a portion of every purchase made between April 23 and May 6 to support HRRC—the Cleveland Heights nonprofit working to keep older homes in good repair. Bremec on the Heights Garden Center is located at 13410 Cedar Road, just west of Taylor Road. From its selection of plants to garden decor and supplies, Bremec on the Heights is geared toward the needs of Heights gardeners and homeowners, and supplies organic alternatives for sustainable gardening, including organic fertilizer and pest control, rain barrels and compost bins. One of the many character-defining features of old homes is the richness and warmth of finished wood. After 100 years, the luster of the natural wood can become dulled or discolored due to layers of dirt, old wax buildup, and failure of the original varnish or glaze. Many owners may find the prospect of a careful cleaning and restoration of historic wood to be a daunting or impossible task, while others may mistakenly believe the only method of cleaning it is to strip it entirely and start over. The following tips from the Cleveland Restoration Society make it entirely possible to clean and restore the look of historic, finished wood. The gentlest means of cleaning should always be undertaken first. In this case, whipping one tablespoon of gentle soap, such as Ivory liquid dish soap, in a gallon of warm water will provide ample suds. Dip an old washcloth or undershirt into the suds—not the water—and scrub the area vigorously. Towel dry to remove any excess water, and examine the area. If the finish on the wood remains cloudy, discolored, or dull, the likely culprit is built-up waxy substances or old layers of finish, and additional cleaning is necessary. Spring is a great time to start tackling those home decorating projects on your to-do list, but getting started can be overwhelming. Often we just need some ideas and a little help to get us going. Here are some tips for giving your home a face-lift without breaking your budget. Paint is the quickest and least expensive way to give a room a new look. If you’re having trouble choosing a color, tape several paint swatches up on the wall and glance at them at different times of day—and on different walls—to get an accurate idea of how the color will look. If you’re still having trouble deciding, buy a pint and paint a test wall. Painted stripes, using a wall color and one or two accent colors, are a great way to create the look of wallpaper without the cost and installation challenge. The Heights has many inexpensive places to shop for home decorating items. Thrift stores and consignment shops are good options, and local antique stores carry some surprisingly affordable, unique items. Dollar stores sometimes have nice towels, linens, and shower curtains, and discount stores like Tuesday Morning, HomeGoods and Marshall’s have excellent closeout values. Marc’s stores have great houseware departments, though some locations have a bigger selection than others. City Buddha carries beautiful imported items. Craigslist, eBay, and Freecycle are also good sources for local furniture and decorating bargains. Heights Community Congress (HCC) announces its 35th Heights Heritage Home and Garden Tour. The tour brings attendees from all over Northeast Ohio and beyond, and will feature spectacular and unusual homes as well as gardens of every size and design. The theme for this year's tour is "Cleveland Heights Gems," named in honor of HCC's 40th anniversity and the 35th year of the tour. The Home Repair Resource Center (HRRC) is sponsoring a new monthly speaker series to help owners of older homes apply sustainability principles to home remodeling and maintenance projects. "actical Sustainability: New Thinking for Older Homes" will kick off on Wednesday, April 11, at 7:00 p.m. at the Lee Road Library. Cleveland Heights resident and former HRRC board member Fred Cortright, whose experience includes building energy efficient homes for Habitat for Humanity, designed the free workshop series. The Food Not Lawns movement is both international and hyperlocal, dedicated to replacing lawns—or some portion of them—with edible gardens in the name of sufficiency and sustainability. Edible in this context broadly includes food for butterflies, birds and other wildlife as well as fruits, vegetables, flowers and herbs. The same plants often serve many functions, benefiting humans and other species alike. The nonnative grass varieties that make up most lawns feed no one, with the possible exception of the Japanese beetle larvae that thrive in their roots. Residents of all communities can now attend the Home Repair Resource Center’s (HRRC) home repair workshops. Previously, workshop participation had been limited to Cleveland Heights residents. Individual homeowners and the Cleveland Heights nonprofit Home Repair Resource Center (HRRC) will benefit from a new program developed by Dominion East Ohio. Using Dominion’s Home Performance with Energy Star Program, homeowners who are Dominion residential gas customers can qualify for a “deep discount” on the cost of an energy audit, receiving a three- to four-hour energy assessment – normally a $500 value – for only $50. In addition, if a caller mentions HRRC, the nonprofit will receive a donation of $35 from GoodCents, the company providing the audits. For HRRC to benefit, the call to schedule an audit must be made by Nov. 15 to Katie Schade at (800) 653-3445 ext. 1885. Two summers ago, Audrey Miller of Noble Road Presbyterian Church and Tonya Butler, director of Discovery Preschool (located in the church) created a vegetable garden to involve the school-age kids attending the summer program at the preschool. Miller recruited Karen Reinke, who does most of the gardening at the church, and Renke got Carolyn Sugiuchi and Joanne Westin to help. Later that summer, Westin called on Kathie Ellis, a fellow gardener and experienced elementary school teacher, for additional assistance. Supported by Discovery staff members, Rosemary Sanderfer, Annette Butts and Angela Outlaw, the first summer was fun and successful. The Heritage Home Program is a joint initiative of the City of Cleveland Heights and the Cleveland Restoration Society (CRS), offering low-interest home repair and renovation loans for homeowners of properties built before 1961. Kelli Cone, a local realtor with Keller Williams, knows firsthand how beneficial the program can be. Painting aluminum siding: good or bad idea? Many Northeast Ohio homes that were built in the 60s, 70s and 80s were finished with aluminum siding. Homeowners were led to believe that the exteriors of their homes would be "maintenance free." If your home was built or re-sided during that time, you have undoubtedly realized that this is not the case. Because of exposure to the sun, most aluminum siding becomes "chalky" and faded after about 15 years. Once this happens, the original baked-on enamel coating washes off with heavy rain. For the third year, Neubert Painting–a Lakewood-based residential painting contractor–will give away a $10,000 house-painting job to a homeowner or organization that needs and deserves it. Spring and fall are great times of year to plant trees and other landscape plants. Before digging in, take time to select the right tree for the right location, to ensure your planting is successful. 1. Transport with care: Transport your tree from the nursery by covering the canopy to avoid windburn. To avoid damaging fragile roots, keep the root ball moist if you’re not planting immediately.Do not bounce or drop the root ball. 2. Dig In: Dig your hole twice as wide as the root ball and just slightly shallower than the height of the root ball. Scuff and roughen the sides of the planting hole. Compact the bottom of the hole so the tree won’t settle lower. Our yards and gardens are reflections of our personalities, lifestyles and beliefs. When I drive through different communities, both local and far away, I find it interesting to note how lawns are cared for and the role they play in people’s lives. Locally, I’ve either worked on or visited thousands of lawns over the last 20 years and I’ve seen the range from neglected pastures to manicured trophies. I am often asked how to educate oneelf about wine. My answer is to drink as much as you can as often as possible. Although this usually meets with a few chuckles, it is the truth. I get this question a lot, I thought I would outline a few strategies for those of us living in the Heights. First, pay attention. If you like a wine, jot down the name and as much information about the wine as you know. Chances are, you will like other wines that have something in common with this one, e.g. grape variety, origin, style. Now is a good time to look at your yard and garden and make plans for the upcoming season. Home or yard improvement projects often feel overwhelming, if you're unfamiliar with the work involved. Even avid do-it-yourselfers find occasion to call on the expertise of a professional contractor to help them through certain aspects of a challenging project. Overwhelmed by too much paper or too much stuff? Don't know where to start to clean up your home or office? January is National Get Organized Month, and Organizing 4 U has some simple tips on how to achieve your New Year's resolution of becoming more organized. Making room for wildlife in the "City of Beautiful Homes"
University Heights, the “City of Beautiful Homes,” could also be called the “City of Neatly Landscaped Lawns.” But one resident, bucking conventions, has turned her property into a certified wildlife habitat site, providing an oasis for the furry and winged residents of University Heights. Gardeners and farmers alike know that regularly adding organic matter builds healthy soil allowing plants to flourish. In the natural environment, plants die and decompose, returning nutrients and organic material to the soil. We interrupt this natural cycle in our urban landscapes because in most cases it’s necessary to clean our yards of landscape debris, piling leaves, sticks and grass clippings on the tree lawn for the city to haul away to a nearby compost facility. A few gardeners compost yard and kitchen waste, but rarely generate enough compost to impact more than a small garden area. In most cases the bulk of our yard waste is composted at some facility and is returned only when we buy composted products and spread them in our landscapes. However, homeowners often do not return enough compost to replace the material that has been removed or that is necessary to sustain healthy soil.